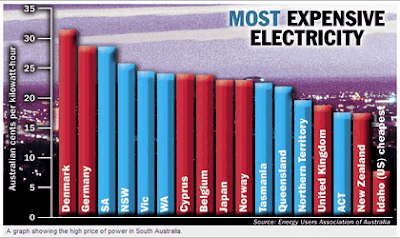 Retail electricity prices paid by Australian households are among the highest in the world. No carbon price contributes to these prices - the carbon price does not take effect until 1 July 2012. It will be a very small component of the price households pay for electricity. TONY ABBOTT: "...we’ve got an abundance, or we should have an abundance, of cheap energy in this country because of our coal and our gas. 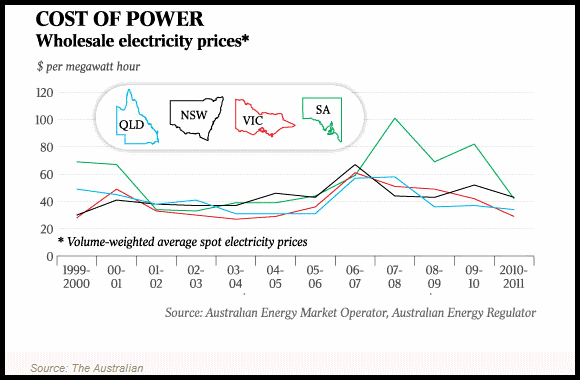 But the trouble is we are deliberately making our energy more expensive – that’s the whole point of a carbon tax..."
FALLING wholesale electricity prices on the National Electricity Market are not being passed on to consumers, who are paying all-time high power bills. The National Generators Forum says wholesale prices for electricity have fallen because of mild weather, the decline in manufacturing, reduced energy use by households and an increased supply of electricity. $10 per MWh is the same as 1 cent per kWh. A retail price of 30 cents per kWh is 10 times a wholesale price of $30 per MWh. That is, 27 cents out of 30 cents per kWh is payment for the distribution and retailing of electricity. That is, 90 percent of the price (27 cents out of every 30 cents) would be the same even if the electricity was generated with NO carbon dioxide emissions and/or NO "carbon tax" - as with nuclear, hydroelectric, geothermal and solar thermal power stations. For gas-fired power stations emitting about 350 kilograms of carbon dioxide per megawatt hour, a carbon price of $23 per tonne adds less than 1 cent to the price of each kilowatt hour. Tony Abbott's frenzied campaign "to repeal the carbon tax" is over an amount of about 1 cent per kWh! Following widespread alarmist claims in the media of local councils being "hit by a carbon tax" the Parliamentary Secretary for Climate Change and Energy Efficiency, Mark Dreyfus, has released a statement on how the carbon price will apply to pollution from local landfill sites and the potential impact this might have on rates for local communities. An estimate of the value of electricity that can be generated from landfill gas. Landfill gas is mixture of equal volumes of methane and carbon dioxide. Methane weighs less than carbon dioxide. 1 tonne of landfill gas is about 265 kg of methane and 735 kg of carbon dioxide. Methane is charged 21 times the carbon price of carbon dioxide as it is far more effective as a greenhouse gas. For a carbon price of $23 per tonne of carbon dioxide the liability for 1 tonne of landfill gas is about $145. $23 x 1 x 735kg/1000kg for carbon dioxide; $17. Burning 1 tonne of landfill gas converts it to about 1,470 kg of carbon dioxide and some water vapour. The liability for 1 tonne of landfill gas after burning to form 1,470 kg of carbon dioxide is about $34. Generating electricity should produce about 1.5 MWh per tonne of landfill gas. At a retail price of 30 cents a kW-hour which is $300 for one MW-hour the value of this electricity is $450. The carbon tax liability is reduced from $145 to $34, saving $111. No carbon tax may be payable: burning or producing energy from landfill may reduce emissions below the level at which carbon tax becomes payable. 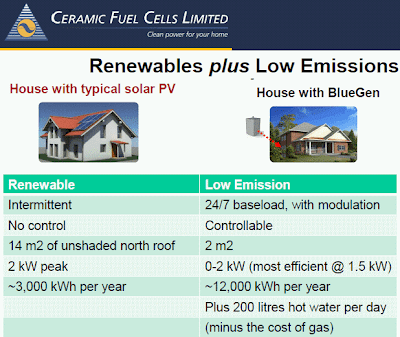 Ceramic Fuel Cells Limited (AIM / ASX: CFU) – a leading developer of high efficiency and low emission electricity generation products for homes and other buildings – is pleased to announce that the Victorian Competition and Efficiency Commission (VCEC) has recommended that feed in tariffs be extended to include small scale low emissions generators like fuel cells. The draft report by VCEC, released on Friday 18 May, recommends that Victoria’s solar PV feed in tariff be broadened to include all low-emissions and renewable technologies, with a requirement that electricity retailers must offer a wholesale price based feed in tariff for distributed generation of 100 kilowatts or less. Feed-in tariffs are payments to distributed generators for electricity generated at their premises and fed back into the power grid. VCEC recommends that the feed in tariff be based on the wholesale price for electricity. A report commissioned by VCEC notes that this value varies depending on time, location, and the type of generation technology. The report estimates that currently this value is approximately seven cents per kilowatt hour. 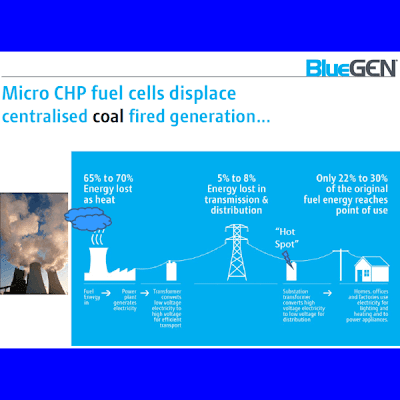 Ceramic Fuel Cells’ BlueGen gas to electricity generator would be eligible for this feed in tariff, making Victoria the first State in Australia to provide a feed in tariff for fuel cells. BlueGen customers already receive feed in tariffs in Germany and the United Kingdom. Simplifying the process for connecting small scale generators to the power grid. The carbon tax has claimed its first victim, with Norsk Hydro announcing it intends to close its Hunter aluminium smelter. The move will put 350 people out of work, affect countless contractors, and have a devastating effect on communities around the plant. The news sparked a furore in federal parliament, with the Prime Minister and Opposition Leader trading barbs, and a Hunter MP ejected. Alcoa have announced a review of the future of Point Henry Smelter near Anglesea. Alcoa also has an aluminium plant at Portland with newer technology which employs a similar number of people and is not under review. "A combination of factors, including metal prices, input costs and exchange rates, have resulted in the Point Henry smelter becoming unprofitable," said Alan Cransberg, Alcoa of Australia Managing Director. "...The current situation makes it difficult for Point Henry to be globally competitive in the foreseeable future." "...There is no question mark over the future of the Portland operation, simply because the company has invested in the latest technology there," he said. 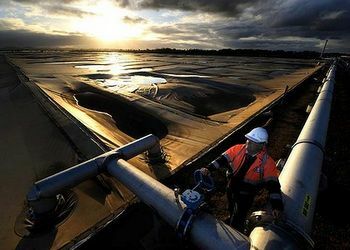 VICTORIANS will pay an extra $5 million a year for water after Melbourne Water was included on a carbon tax "hit list". The first 250 companies that have to pay for their pollution from July 1, including Crown casino and La Trobe University, have been named by the Clean Energy Regulator. Melbourne Water's carbon dioxide emissions come mainly from sewage plants, and will be passed on to retailers, who will then slug consumers. It is believed the company will pay an extra $5 million for carbon permits, which will hit households when prices are reset for 2013-14 by the Essential Services Commission. Partnering with energy company AGL, it built a biogas-fired power plant on site. Methane is captured by air-tight lagoon covers, funnelled in the biogas plant and used to generate about 95 per cent of the energy needed on-site. "People would probably be surprised to know that sewage is effectively powering one of Australia's biggest sewage treatment facilities. It's the ultimate feedback loop," said Melbourne Water spokesman Paul Pretto. While cutting odour has been the main driver, the organisation estimates the biogas program has cut the plant's emissions by 330,000 tonnes since 2005, and reduced its annual energy bill by about $3 million. Another $2 million a year has been saved at its Eastern Treatment Plant at Bangholme. Melbourne Water is one of about 500 companies facing the carbon price - its two treatment plants emit about 180,000 tonnes a year, equating to a $4.1 million bill - but it says its liability has already been dramatically reduced. It is still evaluating the impact of the carbon price, but expects investment in biogas to become more attractive. I’m headed for Wagga Wagga, the carbon tax capital of NSW. Wagga City Council is one of a few councils that have not taken action to prevent landfill gas emissions. Many have installed gas generators and sell the power and also earn renewable energy certificates. The Clean Energy Council website lists a number of case studies. 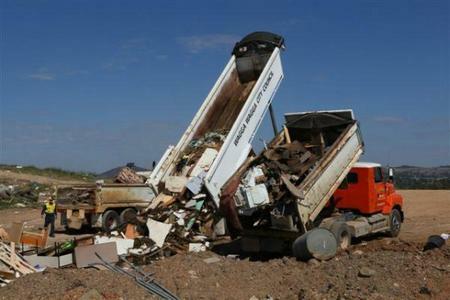 The first on the list is Belconnen landfill. The Australian Government Clean Energy Future website describes assistance available for landfill operators to prevent landfill gas emissions and potentially earn revenue. This is under a program called the Carbon Farming Initiative. And this is how it ends. In Wagga Wagga, population 63,000, residents will potentially be hit with annual carbon tax bills of $600,000 or more – just for taking their rubbish to the tip. Wagga council is already budgeting for this ridiculous outcome based on carbon dioxide emission totals from the local tip during past years. Under the government’s carbon tax rules, landfill sites that emit more than 25,000 tonnes of CO2 per year face a $23 per tonne penalty. Read the complete copy of Tim Blair's propaganda against the carbon tax policy. Read about Landfill Emissions Income Potential and how many Councils capture landfill gas to avoid any liability under the Clean Energy Future legislation. Let me begin by thanking the Global Warming Policy Foundation for the invitation to deliver this lecture. 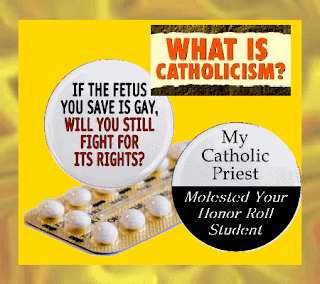 Why might a Catholic bishop comment? We might ask whether my scepticism is yet another example of religious ignorance and intransigence opposing the forward progress of science as is alleged in the confrontations between Galileo and the Papacy in the early seventeenth century, when the Church party on the evidence of scripture insisted that the sun moved around the earth. It is not generally realized that in 2001 at least, one of the IPCC Third Assessment Report’s Working Groups agreed: “In climate research and modelling, we are dealing with a coupled, non-linear, chaotic system, and therefore that the long-term prediction of future climate states is not possible”. Arnold helped to explain why the systems around us work, how fluids flow. Like Lorenz, he found that small changes had an immense impact on outcomes. For him long-range weather forecasting was effectively impossible, because small events could have dramatic, unforeseen consequences. Fluctuations in temperature (red line) and in the atmospheric concentration of carbon dioxide (yellow) over the past 649,000 years. "SMALL" Change: The vertical red bar at the end is the increase in atmospheric carbon dioxide levels over the past two centuries and before 2007. From "A brief history of the universe"
Human beings first arrived in Europe about 35,000 years ago. The first cities were only built 8,800 years ago. "small events could have dramatic, unforeseen consequences." The implications of this description are perhaps a little obscure. 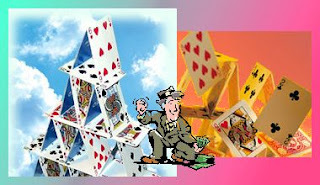 An example of a non-linear system is a house-of-cards. It is susceptible to sudden collapse when a single card is moved even though it is seemingly stable when other small changes are made. That is, small events can have dramatic, unforeseen consequences. Very small changes can create completely unexpected and seemingly disproportionate changes with little warning. Predicting behaviour of the system will be very difficult. Removing a "trigger" that seemingly precipitated a disproportionate change will most likely fail to restore the system to its previous state. TONY JONES, JOURNALIST (ABC TV, Lateline, 2004): Have you met Archbishop Pell during the election campaign? TONY JONES: Not that you can recall, because we believe that you've had at least one meeting with him quite recently. TONY JONES: You don't recall that? At the Presbytery in Sydney. TONY ABBOTT: Actually, now that you mention it, I did meet with Cardinal Pell. So what? TONY ABBOTT: If you want to put a price on carbon why not just do it with a simple tax. Why not ask motorists to pay more? Why not ask electricity consumers to pay more? And then at the end of the year, you can take your invoices to the tax office and get a rebate on the carbon tax you paid. It would be burdensome, all taxes are burdensome, but it would certainly change the price on carbon, raise the price of carbon without increasing in any way the overall tax burden. Source: Sydney Morning Herald, February 24, 2011 "Carbon price to start July 2012"
JULIA GILLARD: This is an essential economic reform, and it is the right thing to do. Carbon pollution is a threat to our country, and a threat to our future prosperity. I do not believe that Australia needs to lead the world on climate change, but I also don't believe that we can afford to be left behind. That is why the time is right and the time is now. Every cent raised from pricing carbon will go to assisting households, helping businesses manage the transition and funding climate change programs. Source: Courier Mail, March 1, 2011 "Abbott will scrap carbon tax if PM"
TONY ABBOTT: We will oppose this in opposition. We will rescind it in government. I first became interested in the question in the 1990s when studying the anti-human claims of the “deep Greens”, so I had long suspected that those predicting dangerous and increasing anthropogenic global warming were overstating their case. During the years 2008-09 it was dangerous for an Australian politician to voice dissent unless he was from a country electorate. Opponents were silenced. As I was not up for re-election and I suspected the Emperor had few if any clothes, I made a few more small public statements. 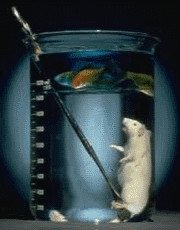 In my view the evidence is insufficient to achieve practical certainty on many of these scientific issues. The cost of attempts to make global warming go away will be very heavy. They may be levied initially on “the big polluters” but they will eventually trickle down to the end-users. Efforts to offset the effects on the vulnerable are well intentioned but history tells us they can only ever be partially successful. Will the costs and the disruption be justified by the benefits? We must be sure the solutions being proposed are valid, the benefits are real and the end result justifies the impositions on the community, particularly the most vulnerable. You will gather that I have concerns on all three fronts. Are there any long term benefits from the schemes to combat global warming, apart from extra tax revenues for governments and income for those devising and implementing the schemes? Will the burdens be shared generally, or fall mainly on the shoulders of the battlers, the poor? Another useful Latin maxim is “in dubio non agitur”: don’t act when in doubt. There is no precautionary principle, only the criteria for assessing what actions are prudent. Is Coalition Climate Change Policy prescribed by Cardinal Pell? I first became interested in the question in the 1990s when studying the anti-human claims of the “deep Greens”, so I had long suspected that those predicting dangerous and increasing anthropogenic global warming were overstating their case. In my view the evidence is insufficient to achieve practical certainty on many of these scientific issues. Much less is there validation to justify huge public expenditure on these phantoms. The immense financial costs true-believers would impose on economies can be compared with the sacrifices offered traditionally in religion, and the sale of carbon credits with the pre-Reformation practice of selling indulgences. Some measures to reduce carbon dioxide emissions may be relatively inexpensive. It seems prudent to adopt them. Innovations in energy production and the way energy is used that increase efficiency may save money and happen coincidentally to reduce carbon dioxide emissions. Implementing such innovations as rapidly as possible will make the cost savings available sooner. They will help to reduce carbon dioxide emissions too, even though this may be an unintended, serendipitous benefit. The cost of energy is increasing rapidly for reasons that have nothing to do with attempts to "make global warming go away". The social harm of increasing energy costs is exactly the same no matter what the reason. Effort to minimise this harm is equally important. The intensity of the global warming debate has tended to leave these other sources of harm by the way-side. A number however are inflicting significantly greater financial hardship and there is the potential to find better and less harmful approaches. See "Discussion of Electricity Prices" on a number of other factors creating rapid energy price increases, and avenues to overcome them. Cardinal Pell also highlights some key attributes of climate science that give little reason for comfort: “In climate research and modelling, we are dealing with a coupled, non-linear, chaotic system, and therefore that the long-term prediction of future climate states is not possible”. ‘One Christian Perspective on Climate Change’. Catholic Archbishop of Sydney Cardinal George Pell was challenged by Columbans after he gave he talk in London questioning the cost benefits of financing action to curb climate change, such as funding clean, renewable energy. “The cost of attempts to make global warming go away will be very heavy” he said on 26 October; “they may be levied initially on ‘the big polluters’ but they will eventually trickle down to the end-users”. It was only under questioning from the audience in a two-thirds full Westminster Cathedral Hall that Cardinal Pell made clear that he was speaking as an individual and not presenting an official Catholic stance. Ellen pointed out that a joint communiqué issued by the Holy See and the British Government last September, during the papal visit, clearly indicates the Vatican’s position. The second paragraph stated that, ‘The British Government and the Holy See share a conviction of the urgent need for action to address the challenge of climate change’ and that ‘action is needed at every level from the governmental to the individual if we are to rapidly reduce greenhouse gas emissions, to set in motion the transition to a global low-carbon economy, and to assist poor and vulnerable countries to adapt to the impacts of climate change that are already inevitable’.